Well-resourced, quality journalism has never been more important to society. At a time when it is under more pressure than ever from advertising, technology, economics and new competitors, we provide journalists and publishers with the protection and the support they need to do their job, hold the powerful to account and speak with confidence and security. 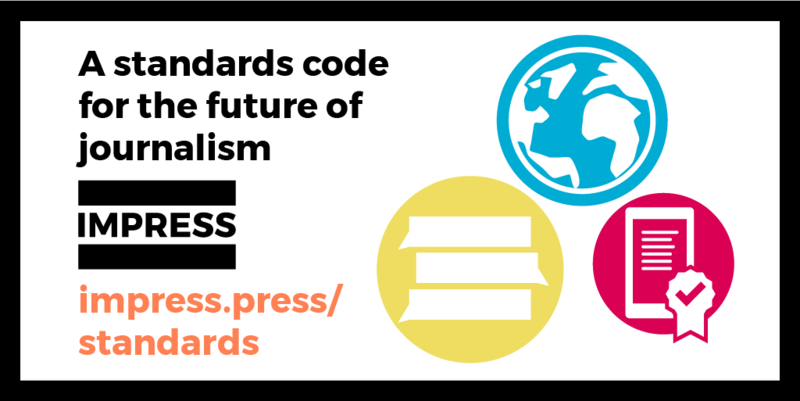 Through our progressive Standards Code, we help journalists take the steps to protect themselves and to ensure accuracy, in an age where they are under more pressure than ever from economics, technology and new ‘competitors’. Through our work we build support among the public for responsible, independent journalism, by supporting trusted new sources and providing those unfairly harmed with a cost-effective way to seek redress where our members don’t match up to our standards. If you work for a news publication and you believe your employer is involved in wrongdoing or is encouraging you or others in your workplace to commit unethical or unlawful practices, and you want to report it confidentially, you can contact our whistleblowing hotline. Our partners at the charity Protect can give confidential and expert advice. We would love to hear your views on our work. Subscribe to our email updates on the latest developments at IMPRESS by signing up to our newsletter. Get in touch if you would like to know more about our work or for media enquiries. You can contact the IMPRESS team here, on info@impress.press or on +44 (0)20 3325 4288. Join us at our annual Trust in Journalism Conference!